In this computer simulation, three of Jupiter’s moons cast their shadows on the face of Jupiter as they will appear on the afternoon of June 3. 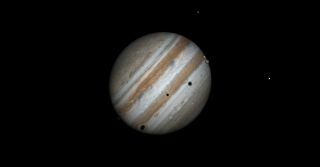 Three of Jupiter's moons will cast their dark shadows on the face of the giant planet Tuesday (June 3), but you might need a computer in order to see it. Most owners of small telescopes enjoy watching the dance of Jupiter’s four largest moons, first observed by Galileo in 1609. As these moons circle Jupiter, they often pass in front of the giant planet, casting their tiny shadows on its face. Although these shadows are very small, they are also intensely black, appearing like tiny drops of ink on the bright surface of Jupiter’s cloud deck. Such shadow transits are quite frequent, occurring as often as once every 42 hours in the case of Io, Jupiter’s innermost satellite. It is much more rare for two satellites to be placed so that their shadows fall on Jupiter simultaneously, and rarer still for three satellites. Four satellites? That can never happen because Jupiter’s moons are in a precise mathematical relationship with on another such that all four satellites can never find themselves on the same side of the planet at the same time. This triple transit is a difficult toview from the surface of Earth. Jupiteris now approaching the time of year when it passes behind the sun, and is lost to view for a couple of months. There’s only a short window when skywatchers can observe Jupiter each night. That period of time takes place between sunset, and the time when Jupiter is too low to be observed, lost in the turbulence of Earth’s atmosphere. 3:57 a.m. EDT (0757 GMT) – Callisto begins to cross in front of Jupiter. 8:01 a.m. EDT (1201 GMT) – Callisto finishes its transit of Jupiter. 10:56 a.m. EDT (1456 GMT) – Ganymede begins to cross in front of Jupiter. 11:24 a.m. EDT (1524 GMT) – Callisto’s shadow begins to cross Jupiter. 11:35 a.m. EDT (1535 GMT) – Europa begins to cross in front of Jupiter. 11:57 a.m. EDT (1557 GMT) – Io disappears behind Jupiter. 1:08 p.m. EDT (1708 GMT) – Europa’s shadow begins across Jupiter (that’s two shadows). 2:08 p.m. EDT (1808 GMT) – Ganymede’s shadow begins to cross, making it three shadows. 2:18 p.m. EDT (1815 GMT) – Three shadows are on Jupiter: Ganymede, Europa, and Callisto from left to right. Europa and Ganymede themselves are about to move off Jupiter’s disk, smaller Europa just above larger Ganymede. Notice that, because of the angle from which the Sun is shining, over your right shoulder, the shadows of these two moons are widely separated. 2:16 p.m. EDT (1816 GMT) – Ganymede moves off Jupiter’s disk. 2:18 p.m. EDT (1818 GMT) – Europa moves off Jupiter’s disk. 3:02 p.m. EDT (1902 GMT) – Io reappears from Jupiter’s shadow. 3:44 p.m. EDT (1944 GMT) – Callisto’s shadow moves off Jupiter, 4 hours and 20 minutes after it entered. 3:53 p.m. EDT (1953 GMT) – Europa’s shadow moves off Jupiter, 4 hours and 18 minutes after entering. 5:33 p.m. EDT (2133 GMT) – Ganymede’s shadow moves off, 3 hours and 18 minutes after it entered. While it won't be easy to see the transit from Earth's surface, it's still possible. There is only a narrow band on Earth where the sun has set but Jupiter is still reasonably high in the sky. Where is that band? A planetarium program like Starry Night lets you figure this out. The most interesting point in this triple transit is just after the third shadow will enter onto Jupiter’s disk and just before Ganymede will move off at about 2:15 p.m. EDT (1815 GMT). So, where would be a good viewing location? Let’s concentrate on that critical time: 2:15 p.m. EDT (1815 GMT). If we set Starry Night to that time and switch our viewing location to Jupiter, we can then look back towards Earth and see where the sun has just set at that time. The sunset terminator lies across Eastern Europe, and a good viewing location would be Kiev, Ukraine. In Kiev, sunset will be a 9:03 p.m. local time, just a few minutes before Ganymede’s shadow enters the disk at 9:08. Jupiter will still be 22 degrees above the western horizon, high enough for a good view. Modern planetarium software can act as our time machine to view future or past events, and also lets us travel in space to view these events from the perfect location. This article was provided to Space.com by Simulation Curriculum, the leader in space science curriculum solutions and the makers of Starry Night and SkySafari. Follow Starry Night on Twitter @StarryNightEdu. Follow us @Spacedotcom, Facebook and Google+. Original article on Space.com.